So Last Century Vintage & Retro Fair was established in spring 2015 by friends Alison Davis and Alan Old. The first event took place in September 2015 in Beckenham, south east London and was a resounding success, spurring-on the duo to hold another two months later and more the following year. 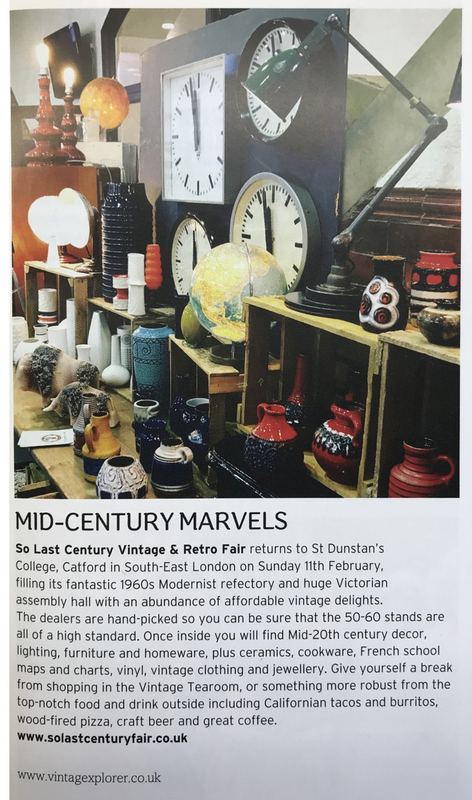 2017 saw So Last Century open another Vintage and Retro Fair in Catford and start its popular Vintage Market at Beckenham Place Mansion (read the blog here) In May 2018 another location was added, this time in Tooting. December 2018 saw So Last Century teaming up with Wembley Park to hold their first event in north west London, a Vintage Christmas Market, at the new Boxpark Wembley. 2019 promises events at some exciting new locations, as well as many more at the current venues. Below are some press articles. Please click on the image to enlarge.